It's off season break for Rafael Nadal but it seems that he's not really taking things slow. 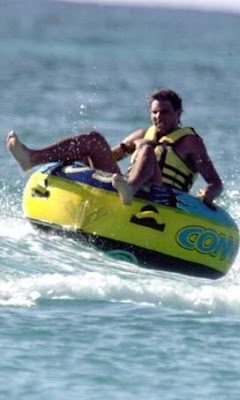 Instead of resting and recuperating from his knee injury, Nadal was seen participating in a resort's array of activities during his holiday with girlfriend Xisca in Mauritius. 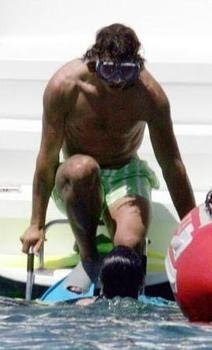 Nadal flexed his muscles while riding a 'doughnut', snorkeling, swimming and running along the beach, showing no sign of the injury which prevented him from playing in the Davis Cup in Argentina. His fellow Spaniard team mates will be playing against the Argentines tonight in a final match.